When you buy an HD movie in iTunes, did you know you can also receive the SD version for free? And why would you need the SD version? Ask your iPhone. Or too much digital memory for your multimedia needs! As a Road Warrior, I happen to like having a few movies at any given moment in my iPhone. I really haven’t had any media management concerns on my iPhone 4S over the past couple of years, because I’ve got the full boat… 64 GB of memory. So I feel I can live a little large and jam some extra cinema into my iPhone’s playlist if I prefer. And I don’t mind admitting I’ve downloaded a few flicks lately. The last one was “Skyfall,” the latest James Bond and arguably one of the best. Then last weekend while uploading some fun photos of my three year old, I realized my iPhone barely had enough memory for Siri to blurt out one of her snarky retorts. By Grabthar’s Hammer, what happened?! So I checked out my iTunes library and realized Mr. Craig’s high-definition Bond adventure had targeted almost 6 GB of precious flash media on my iPhone. Well that didn’t seem right. I know HD content can create large files, but I thought with compression technologies, the movie studios wouldn’t be offering up digital files quite so big. The only difference was the other movies were downloaded via an iTunes code packaged with the Blu-ray Discs I had bought. And “Skyfall” was purchased directly from iTunes. Apple had been running it at a special price. I sprinted over to my Blu-ray Disc shelf and studied the cases. As I looked more closely at the packaging, I came to the uncomfortable realization that my bonus ‘digital copies’ via iTunes had not been downloaded in HD after all. The iTunes movie codes inserted in the Blu-ray Disc cases only unlocked the standard definition files. Well, I guess that explains the size discrepancy. So… iTunes SD movie downloads provided by glorious Blu-ray Discs in HD? That doesn’t feel quite right. whether I should stick with buying physical Blu-ray Discs or give in and go all in with iTunes movie purchases. As much as I prefer to own HD movie files for use on my larger displays, I don’t believe smartphone screens really show a significant difference between HD and SD. But more importantly, my iPhone (or any smartphone for that matter) can’t handle more than a few HD movies at a time. 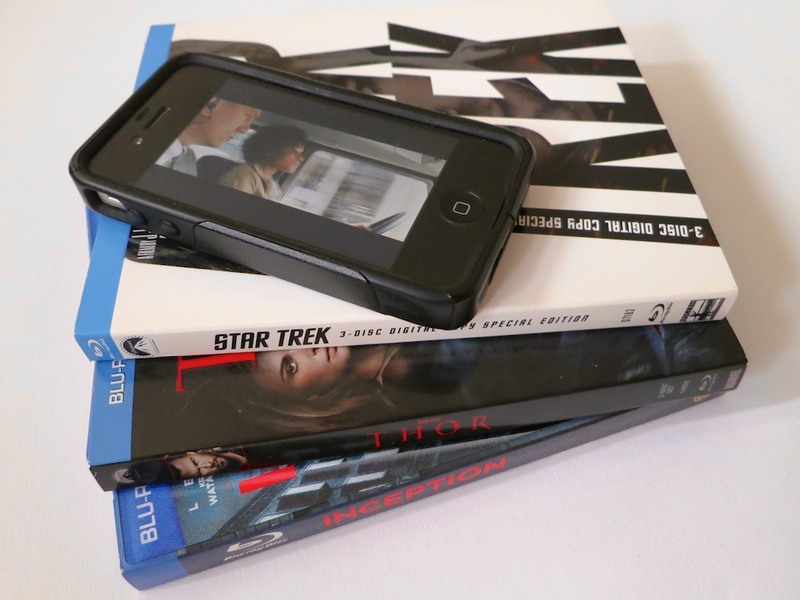 If you only own a 16 GB smartphone, it’s toast after you feed it two movies. Time to find the ‘Mini-Me’ version of 007. So your simple media management solution is to own two files for each movie you buy. But how do you locate the SD peer file, once you’ve bought and downloaded the HD movie master? Sure, you can easily find the SD version in the iTunes Store. But you don’t want to pay again to download the SD sibling, once you’ve already had to pony up for the HD version. Where’s Your Free SD File? The location was not entirely obvious to me even after some online research and a quick review of iTunes itself. But buried in an Apple support page, I found a cryptic answer…. Well that seemed simple enough. So I took at look at my ‘Purchased page’ in iTunes and observed all my movie icons happily waiting for their next screening. But there was nothing to indicate an additional free SD download of my HD Bond. Suddenly the SD versions appeared as available for download! It was like having the keys to the candy store. I clicked, and before you could say, “shaken but not stirred,” I downloaded my SD movie file. So to access your SD content, you simply have to tell iTunes you don’t ‘prefer’ HD… twice. You just don’t want HD… right now. And all this from a tech empire that designs products my three year old could operate well over a year ago. Anyway, that’s how you do it. Your iPhone can now experience some Hollywood Zen. …and still have some room left to answer your next phone call! Hi. I don’t see the box at the bottom right corner of my screen on my phone or iPad! What am I doing wrong?!? Try in iTunes > Store > Purchased > All. Good luck! Oh my god thank you!!!!!! I’ve been searching everywhere- Itunes support was unhelpful cause it went on about display monitor’s and what not-but you got straight to the point!!!! I was going crazy trying to play Thor The Dark World- i couldn’t convert it cause my convreter programs would crash, it wouldn’t play on anything- so thank you for helping!!!!! Hello! Thank you for this!! One question. I’m working with iTunes version 11.1.5 (5). After un-clicking the box “Download HD When Available”, instead of a download link appearing for the SD version, a little iCloud icon appears in the upper right corner of each movie’s icon. When this is clicked, a download commences. However, thus far, an additional copy of the HD version downloads. Not the SD version. Help? I have a HD movie that I redeemed from iTunes (not purchased from iTunes store). Can I get that SD version as well? I don’t see the option. Thanks for the reply. When I go to the ‘Purchased’ page in iTunes, it shows 6 SD movies that I’ve redeemed in iTunes, but it doesn’t even show the 1 HD movie that I redeemed. I still unchecked the ‘Download HD When Available’ box, but the SD movie still doesn’t show as available. It is in my movie list, but not on the Purchased page. Does that pull up your movie? Clicking on ‘All’ shows my 6 SD redeemed movies, but not the 1 HD. Looks like this is really the issue. If the movie showed, then I should have the option to see the SD download, but I can’t even see the ‘Purchased’ movie. But the movie shows up in my Movie list and I can hit Play. I can also see that it takes up 4.43 GB, so I’d love to get the smaller SD version to watch on my PC. Just not sure how.